With its relatively small size of .09” in diameter, #8 lead shot isn’t the best choice for hunting larger birds -- their thick plumage and skin may prove too much for the little pellets to penetrate. If you are after smaller birds like dove, quail, and pheasant, however, that small size is a boon because it packs enough punch to bring them down without ruining your trophy. 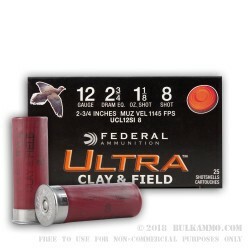 This 12 Gauge shell by Federal is loaded with 1 ⅛ ounces of the shot (approximately 461 pellets, to be precise), which provides an effective spread at 30 yards for both birds as well as clays. If you’re making your rounds on the ranch, consider dispatching rattlers with the stuff as well! 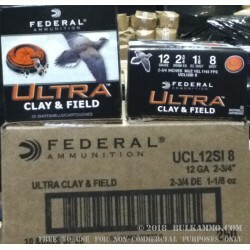 Minnesotan ammunition manufacturer Federal has developed countless specialized shells for every kind of shooting, and this Ultra Clay & Field shell quite nicely accommodates both of the domains its name covers. 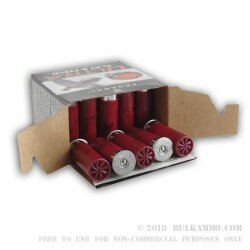 Their commitment to building all of their ammunition from the ground up with high quality primers, wads, and powders have rightly made them the go-to for shooting enthusiasts around the country.